Imaginary Sunshine » Study study study! Good flipping grief, there’s only so much stupid study questions I can go through before I want to break down and cry. My first final is tomorrow, worth 45% of my final grade (which is actually low compared to all of the other classes that I’m taking this term – everything else is 50%, 50% and 60%). Three cheers for everything boiling down to 2 hours to 3 hours? Such is the life of a university student. 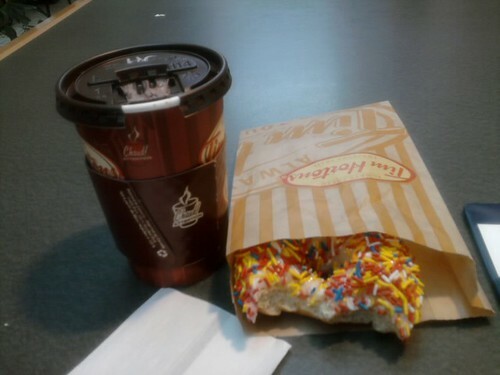 On the brightside, my lunch today consisted of a hot chocolate and a vanilla with sprinkles donut? Excellent dietary habits, I have them. Noommmm. You know it’s good to have a doughnut every once in a while. I haven’t had any in a while because they’re too sweet for my liking. But I had chocolate! Hey, I say you’ve earned that nutritious lunch! And it looks mighty yummy if you ask me. Good luck on your final! I do not envy you, my dear. Not one bit. I know exactly what you mean!! I’ve been hopped up on Tim Horton’s coffee for the last two weeks because of finals. I, too, am taking nursing here in BC!